There’s an interesting trend in webcomics for a push onto mobile devices. I think it started with Clickwheel.com (which apparently no longer exists, hence no link), which tried to bring comics to the iPod by encoding them as short video files syndicated like a podcast. I thought this was an interesting idea, and I was even offered an opportunity to get into it on the ground flood, right when it started. However, I had a number of technical and rights management questions about the service and dragged my feet, eventually losing out on the deal and never following up on it. Given that the domain is now owned by a Norwegian ISP that apparently serves up malware, I’d say apathy may have been the right choice. Nowadays the hot new distribution medium is to put an app on the (seemingly) ubiquitous iPhone (or its GSM-crippled sibling, the iPod Touch). Keenspot was the first place I remember seeing webcomic iPhone apps showing up, although I can’t say for certain that they started the trend. Since then, I’ve seen iPhone apps for various comics popping up here and there. The one I’ve been watching the closest has been Howard Tayler’s Schlock Mercenary (since Howard and I follow each other on Twitter and Facebook). It’s a curious trend to be certain, and it certainly has an element of “hipness” to it. After all, the iPhone is the “it” mobile device these days. And one thing every webcartoonist wants is more eyeballs reading their comics. Certainly it makes sense to go where those eyeballs are, to reach as many potential readers as possible. The iPhone isn’t the last word in mobile computing. Now, before the fan boys start picking up your torches and pitchforks, let me elaborate. I have nothing against the iPhone. In fact, at one point, I seriously considered getting one. The GPF Year Nine story “iDilemma” is actually semi-autobiographical. (GPF Premium subscribers should check out the Author’s Notes for that story to see how it diverges from real life.) In the end, it all boiled down to economics, just as it did for Nick and Ki; it was less expensive for me to buy my current Treo 700p without subsidy than for me to break my contract with my current carrier, switch to AT&T, buy the iPhone plus another phone for my wife, and so on. While I passed on the device itself, several of my coworkers at my day job have iPhones, so I can pretty much get access to one to play with any time I wish. Thus I’m familiar enough with how it works and all the whiz-bang spiffiness it purports to have. I know a thing or two about what it does right, what it does wrong, and how it’s revolutionized the mobile computing or “smartphone” industry. That said, the iPhone’s 30+ million units pales in comparison to the number of BlackBerry devices in circulation. The iPhone represents one device, one platform, on one network. BlackBerries are available in many form factors from almost every wireless carrier. On top of that, Android is a rapidly-growing platform; while it hasn’t yet matched the numbers of the iPhone, like the BlackBerry it comes in many flavors from many manufacturers and can be found on almost every network. It won’t be long before Android phones overtake iPhones in number by mere aggregation of disparate devices. And while some folks dismiss Palm as a has-been in the market, the Pre and the Pixi are selling modestly and may represent a comeback for the company. (Don’t forget the many of us who, ahem, still use good ol’ Palm OS, myself included, despite its age.) No matter how much we’d all wish it just went away, Windows Mobile still exists and people are still suckered into buying phones with it installed. And all of this ignores the biggest player of all in the field: Symbian, which runs about half of all mobile phones in the world. Right there, I’ve listed off seven mobile platforms, including the iPhone. To pick one would severely limit the potential to reach new customers. To pick one with such a small market share (~14% as of Q2 2009) would be even more limiting. If my goal were to reach as many eyeballs as possible, why would I focus on one tiny segment of the market, simply because it’s the one everyone is talking about at the moment? After all, everyone might be talking about something else in a couple months. Of course, this plethora of platforms opens up another can of worms. My goal with GPF has always been to be as accessible as possible to as many people as possible. Although the comic is (currently) confined to the English speaking world, it is available to just about anyone with a Web browser. I carefully designed the site to be as cross-browser compatible as possible, sometimes even sticking with older technologies longer than I should so the site will keep working in older browsers. If nothing else, it degrades gracefully and is still functional if you don’t have something top of the line. For that matter, thanks t0 our Oh No Robot transcriptions, you can even read 95+% of the archives with a text browser! That also means screen readers for the visually impaired can be used to enjoy the strip. It’s not ideal, of course, but it’s functional, and it’s helped us garner fans in ways you might not expect. And the answer, my friend, is the same as it is the desktop: the Web browser. What piece of software do all the nifty little gadgets listed above have in common? A Web browser, of course. Some make it the core of everything the device does, like in webOS and to some extent the iPhone. To others, it’s just another app available among many. But even the most rudimentary phones have simple browsers these days, enough to grab small snippets of HTML and display it competently. Even my Treo, which most iPhone users would likely scoff at, allows me to do the odd bit of online banking, news reading, and forum checking. While no single mobile platform is ubiquitous, the Web browser itself comes alarmingly close. So I’m happy to announce the creation of GPF Mobile, the official mobile-optimized version of the GPF site. There’s nothing special to learn or type in; just visit the main GPF site at the usual URL and it will detect your mobile device and bounce it to the mobile site seamlessly. With the exception of one or two multimedia-rich updates, you can read the entire comic archive, browse the News archive, read the forum, or search the wiki. If you are a Premium subscriber, you can do all of this ad free, as well as get mobile access to the Jeff’s Sketchbook and Rumor Mill archives. The entire mobile site is specially optimized to minimize clutter and trim bandwidth, so it loads fast and doesn’t break your data plan. But if you have a smartphone with a bit more horsepower and a fatter pipe, switching to the “full” site is as simple as a few extra clicks. Just use our site to set a cookie (and you choose its duration) and have access to the full size for as long as you choose. I’ve been using the mobile site myself for months now, especially to keep track of the forum while I’m on the road, and it’s been beta-tested by a number of hand-picked Faulties. It’s not necessarily pretty (in fact, it’s downright Spartan), but it does let you get your GPF fix on the go. Best of all, it works with BlackBerries, Android, webOS, Palm OS, Symbian, Windows Mobile, and… yes, folks, wait for it… the iPhone. I guarantee that bookmark will take up less valuable storage space than some bloated, unnecessary “app”. Recently, our family took a long, hard look at some stock options my wife had been sitting on for a while and discovered that, even in the current questionable economic client, these options were looking pretty good. Well, a bit better than just “pretty good”. How about we say, “even after taxes, ‘pretty good’ still looks like an understatement”. After agonizing for a while over whether we should pull them all now or wait for the chance for the stock to go up even further, we decided to pull the trigger and take them all at once. After immediately moving the money to the savings account (where it will earn the most interest while still remaining liquid), we sat down and rationed how to slice up our piping hot and fresh money pie. Healthy chunks have or will go into numerous investments, of course, including the boy’s college fund and both long and short-term investments with decent returns. But we also wanted to keep some of that for ourselves, just to have a little fun. We’re planning on getting Ben a nice play set next spring or summer, and earmarked some to buy a few “toys” for ourselves. The biggest “toys” are a new 55″ (139.7 cm for you metric-heads) LED LCD high-definition television, wall mounted, and a Blu-ray capable home theater system. Let me tell you folks, I was one of those people skeptical of the “high definition” craze when I had no basis of comparison. But after watching good ol’ standard DVDs on this thing and comparing them to what we got on our old 57″ (144.78 cm) projection TV, the difference is amazing. And that’s with “standard” definition DVDs! I think we still haven’t played an actual Blu-ray disc in this thing yet. And while surround sound is generally relegated to a gimmick in my book, I will admit that at times it’s a pretty good gimmick. I only wish now I actually had time to watch anything. But none of that is the point of this post. Rather, this is about the unilateral proliferation of the ubiquitous remote control. You know what I’m talking about. Every A/V device comes with one, and no matter what the manual tells you, you can try to program it to control your other devices, but you inevitably can’t. Either one device partially works but the rest don’t, or there’s one or two critical buttons that you absolutely need that never get mapped, or your device x from manufacturer y is not supported by the remote for device a from manufacturer b. So you end up with three or more remote controls sitting on the arm of your couch, each dedicated to one device and only halfheartedly supporting one or more others, if you’re lucky. You might be able to use the DVD player remote to turn on the TV and control the volume, but you have to switch back to the TV remote to get the aspect ratio right or switch the input mode. Our recent purchase made our ever-breeding collection of remotes even worse. We were fortunate enough that the Tivo remote fully replaced the cable box remote (since the Tivo controls the cable box anyway), but now we were stuck with the Tivo, the TV, the home theater, and the old five-disc DVD player (kept in the loop mostly for its multi-disc capacity), all leaving remotes on the couch. (After about ten seconds of thought, we opted to retire the old VCR completely, eliminating a potential fifth remote.) Turning things on or switching activities required the “remote shuffle”, switching from one device to another to get everything just right. Worst of all, many times there were only a handful of buttons on each remote that were really needed for everyday use, meaning a lot of space, plastic, and silicon was being wasted. Like any good geek, I thought that there had to be a better way. Larry Wall‘s first and second virtues of a great programmer are laziness and impatience, and I have both in spades. (Hubris, the third virtue, is something I struggle with as I have a chronic case of humility.) If only there were a way for me to consolidate all those useless logs into one, a single device that would let me push a single button and have everything just do what it needed to do: turn on what needed to be on and only those devices, put the TV and home theater on the right inputs, adjust settings for a device for one activity and then again when the activity changes, and make sure everything gets turned off when we’re heading out the door. I wanted something “scriptable”, something that with one button press would send off a chain of commands and “just do it”. Yes, there are “universal” remotes with macro languages out there that you can program to do just that. But I’m lazy (virtue #1); I wouldn’t mind a good starting point where most of the work is already done, and I don’t want to exert any more effort that I have to to make everything “just right”. If you hadn’t guessed, we eventually purchased a Logitech Harmony remote, a Harmony One to be exact. For those whose definition of a “universal remote” consists of a $25-50 cheap plastic brick you can pick up at any drug store that “learns” by you pressing buttons on the old remote while pointing it at the new one, the Harmony line might seem like overkill. With prices starting around $100 and skyrocketing from there, Harmony remotes aren’t cheap. But for the premium price you get a ton of premium features that quickly make you wonder why you ever put up with the remote shuffle in the first place. Harmony remotes are driven primarily by a single online database of devices. Using the Harmony software, you enter all the model numbers and it will look them up in the database, returning a pretty good mapping for all their remote keys. The database is pretty extensive, with tens of thousands of devices from thousands of manufacturers. Even our brand new TV (just released when we purchased it according to the manufacturer’s website) and home theater (which still doesn’t show up on their website) were there, ready to go. Best of all, all of the Harmony remotes share the same database, so the cheapest of the line can control the exact same devices as the most expensive. Of course, sometimes the database entries are inaccurate or incomplete since they are often populated by other users. However, Harmony remotes can learn just like the cheap URs can. I’ve been able to add a number of buttons from our home theater remote that were missed in the database import, and hopefully others will be able to share that effort. To control your devices, Harmony uses an “activity” based process that may take a little bit of getting used to. You first need to decide what activities you plan to perform with your devices, such as “watch TV”, “watch DVD”, “play a game console”, etc. Once you have this list, you select what devices are needed for each activity and either let the software map the buttons for you or manually map them yourself. For example, our “watch TV” activity involves the TV, home theater (f0r audio), and Tivo box (which controls the cable). Many of the buttons on the remote map to the Tivo’s controls, so that’s how we switch channels, control video flow, etc. The volume and mute buttons are mapped to the home theater (the TV speakers are turned off). For the Harmony One, old remote buttons that don’t have an easy mapping (like the infamous Tivo “thumbs up” and “thumbs down” buttons) are mapped to “soft buttons” on an LCD touch screen; cheaper Harmony remotes have a simpler text LCD with hard buttons next to each option. Default mappings are easy enough to modify with the Harmony software. When the activity is started, all the relevant devices are turned on if necessary and are switched to whatever inputs and settings you specify. While you remain in that activity, the buttons remain mapped to where you set them. At any time you can switch to a “device mode” that controls a single device exclusively, mapping all the buttons to control that once device. Once you’re done with taht, you can simply switch back to activity mode to restore the activity mappings. When you finish the activity or switch to a different one, devices are turned off and reconfigured as necessary to fit the new role and your button mappings change as appropriate. Hitting the “power” button doesn’t technically turn everything off, but rather ends the current activity and turns off all the devices currently in use… which is often the same thing. So now we have a single remote controlling, either directly or indirectly, five A/V devices. We’ve only pulled out the old remotes once or twice, primarily to learn the missing keys and add them to the Harmony database. We feel more confident that we can hand this remote to one of our less tech-savvy relatives and not come back with infinite picture-in-picture nesting going on and with all the colors shifted blue. I definitely think this thing was a worth-while purchase for us, and I’d heartily recommend it for anyone tired of doing the remote shuffle. Sorry again for the long dry spell. As hinted at in the latest GPF News post, things have been hectic in the Darlington household these past few months, with tons of minute issues slowly chipping away at the overall allotment of free time. The good news for GPF fans, though, is that I should have a good month’s worth of comics in the buffer when the comic restarts on January 5th, and with the holidays behind us I should be able to concentrate more on getting things done and on time. In the tradition of last year’s “Christmas loot” post, I thought I’d post some of the awesome things I received as gifts this year. I know some people might look at this as a bit of bragging—and I can see how it can be read that way—but it’s really not. It’s an honest, geeky desire to share some of the exciting things my friends and family blessed me with out of love and happiness. If you want to read bragging into this, well, that’s your choice and you’re free to ignore this post. Otherwise, let me squeal with geeky glee as I delineate some of the cool things I was blessed to receive from people I love. I’ll start off with a note to the folks: I know some of my family reads this blog, so don’t be offended if I didn’t mention something in particular that you got me. It’s not that it wasn’t memorable or that I didn’t like it; it’s because you know I have the memory of a sieve and I didn’t take copious notes after each present was opened. Since I’m composing this away from where the presents are stashed, I’m doing everything from memory. I also spent most of my time during the present opening ceremonies assembling and subsequently helping Ben play with his new toys, so there were lots of interruptions. So here’s my apologies in advance and don’t forget that blog posts can thankfully be edited. 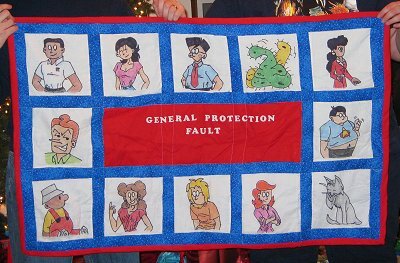 My favorite gift, by far, is the one given to me by my wife. (Well, she signed Ben’s name on the tag, but I know he has neither the budget nor expertise to have picked it out himself. Just remember that if you read this years later, my son.) She got me a Nikon D60 digital SLR camera. As I previously Tweeted, “It’s like giving a 16-year-old with a beat-up ’85 Civic the keys to a sports car.” 10.2 megapixels, “real” lenses, tons of preset and manual options… it may technically be a “prosumer” or low-end professional camera, but it’s definitely the best I’ve ever had. A nice commemorative Star Trek watch from my parents. Several classic Tom Baker Doctor Who episodes on DVD. Surprisingly, nobody got me the fourth series of the Russell T. Davies/David Tennant series. That’s nothing that a quick trip to Amazon can’t fix, of course. The DC Vault: A Museum in a Box and a hardcover copy of The Watchmen from my sister-in-law and her husband. The prerequisite jeans, sweaters, after shave, etc. They may not be as exciting, of course, but they’re always appreciated. Alas, my beloved LifeDrive is out of commission. This past weekend, I was at a local park where my parents were throwing a combined party celebrating my dad’s retirement, my mom’s birthday, their anniversary, and my dad’s birthday (which, coincidentally, all seemed to happen at once and in that order). I was helping clean up after most everyone had left when the LifeDrive was knocked off my hip and took a dive into the concrete floor of the shelter. A year ago, I probably would have panicked. I had heard so many horror stories about how fragile the LifeDrive was compared to other PDAs, with its internal moving parts (i.e. the hard drive). By this point, though, my LD had taken so many tumbles onto so many hard surfaces that I barely batted an eye. Perhaps I’ve been one of those fortunate few to have found a sweet and juicy apple among bushels of lemons… or perhaps there are fewer soured former LD owners out there than everyone thinks and they’re just more vocal. At any rate, I was more annoyed at the inconvenience than concerned. It had taken far worse roller coaster rides than this thanks to gravity. I picked it up, snapped its clip back on my hip, and went back to my business. It was when I got home that I noticed this wasn’t a run-of-the-mill bump. When I tried to use the LD the next day, I found the digitizer was no longer registering correctly. The digitizer, for those who aren’t familiar with PDA anatomy, is the sensor that overlays the LCD screen and detects taps and drags with the stylus (or finger, or pen tip, or whatever impromptu pointing device you choose). The digitizer continued to sense the stylus, but the location was grossly off, so badly in fact that the built-in calibration utility wouldn’t work. When I tried to recalibrate it, the taps would be so far out of place that the utility could not register them and would never exit. I did a careful inspection of the case to make sure it wasn’t bent to the point where it pressed against the digitizer and thus interfered with its operation, but unfortunately that wasn’t the case. So by now it should be on its way to be repaired. Recalling the death and resurrection of my Tungsten C, I contacted Chris Short again, and he should be receiving the device shortly. I once again heartily recommend his services to those who need PDA (especially Palm) repairs. Of course, it could have been worse. I count my blessings that my cats’ mouths are too small to do that kind of damage. I mentioned in the last post a new toy that my wife and I bought each other recently for our anniversary. Well, I got a bit distracted (funny how they expect you to do actual work at your job) and didn’t get a chance to post about it again until now. But here it is. Following the technology lemming trend once again, we’ve added a new gadget to our arsenal: We’re now the proud(?) owners of a TiVo. Like the cell phones, Palms, and the iPod, we’ve discussed getting a DVR for years but never got past the “we should really try it out” discussion phase. Naturally, being cheap, we first discussed getting DVR services from our cable company. One box on top of the TV, one bill in the mail. Simplicity is always good. I think if we were still in NC and still had Time Warner as our cable company we might have actually gone that route. However, our current cabler (who shall remain nameless in fear that I might accidentally promote them) has a completely useless website that contains absolutely no information beyond the generic non-local sales pitch. I couldn’t find anything about DVR services on their site, and not once did I see any kind of price guide. The only local information available was a channel guide and a service phone number. In fact, the only reason I know they offer DVR services is that my in-laws have it. At this point, their mediocre service is already annoying as it is (our cable modem is often hit-or-miss), and if it weren’t for the high-speed Internet services (I’m not a DSL fan), I’d almost be tempted to go with a satellite dish. The next gripe: content protection. You know, as a content creator myself, I can appreciate the desire and need for protecting one’s content from unauthorized reproduction. I’ve been in a constant battle with comic rippers and “inliners” for years who insert my comics into their websites and essentially cheat me out of desperately needed ad revenue. These tactics actually impact my bottom line and seeing as GPF has a very limited budget and thin profit margin it’s something I take very seriously. That said, I’m also very much in favor of consumer’s rights. I have no problem with my readers visiting my site, loading both the comic and the ad (so I get my 0.001¢ in revenue), then saving the comic to their hard drive as part of their personal collection. From there, you can do whatever you want with it… so long as you don’t post it online for others to see (thus taking traffic and ad revenue away from me) or otherwise sell or earn money from it. This content owner vs. consumer’s rights advocate battle is one I constantly wage with myself, and I’m always looking ways to enable you guys to enjoy my strip in new and inventive ways while still scraping up enough cash to buy my meager art supplies. TiVoservice does allow you to copy content recorded on the TiVobox to your home computer. Sure enough, I copied one of my wife’s Good Eats episodes and it played just fine in Windows Media Player. The problem comes in, though, when I try to do just about anything else with it. What I really want to do is load it into my favorite video editing app and trim out the commercials (more as a space saving issue than anything else) then burn several episodes to a DVD. But TiVoToGo files are encrypted with a codec that prevents modification or conversion… without buying the appropriate extra software that keeps the DRM intact, of course. My video editing app can’t read these files and my current favorite video converter, FFmpeg, can’t read the codec to convert the file to something the editor can read. I have no intention pirating Good Eats and redistributing it illegally; quite to the contrary, I want to support Alton Brown and encourage him to create more entertaining content. I just want to archive content that I recorded on my personal recorder to a more permanent form (a DVD) so my wife can watch it later, say if she wants to make Alton’s famous chewy chocolate chip cookies. I did do some Googling and found an app that “frees” the raw MPEG-2 video from its DRM shell, but (a) I hate feeling like I’m doing something shady with a process that I feel is within my rights as a consumer to legally do and (b) I have yet to successfully convert the “freed” video into a format I can work with and edit. So it looks like I’m either going to have to pony up to buy TiVo Desktop Plus to convert my files to other formats (but still not edit them) or buy an upgraded version of my editor app that can actually read and edit MPEG-2 files. This makes for one annoyed customer. Well, that’s probably enough blogging for today. I have no idea if you guys actually enjoy these little mini-review posts. With comments currently disabled, I’ve been feeling like I’m blogging into a black hole with no feedback lately. But I’ve at least found them somewhat interesting and thought you might like to hear from my experiences, especially if you’ve been considering similar purchases yourself. Of course, if you just come here for the obscenely cute baby pictures/stories, I apologize. I’ll have to start posting some more of those soon to counterbalance the geekiness. Last week was my birthday. I usually try to keep very quiet about it, and I don’t go advertising it on the GPF site as a way to drum up artificial congratulations from fans. I know it’s always annoyed me when other webcartoonists do that, expecting their readers to all sing in chorus and make them feel self important, so I expect it annoys others as well. 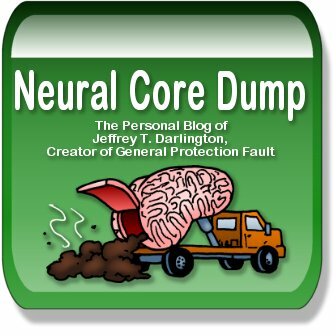 Such cults of personality extend into the blogosphere and other similar user-generated realms, of course, but I know I saw it in the webcomicing world long before the term “blog” came into being. But I digress. I don’t do GPF to have tons of people become my personal cheerleaders and gush on and on about how much they think of me and my work; I do it for myself first and foremost, and it’s an added bonus if one or two (or several tens of thousands) of you enjoy it as well. It did kind of surprise me that nobody on the forum mentioned anything, given I know there are a few of you out there who are obsessive enough to keep track of such things, but I’d much rather have a low-key quiet birthday anyway. And it was a nice birthday. It started off kind of lackluster, as I had a doctor’s appointment to have some blood work done and had to fast (only black coffee… no cream or sugar… blech), followed by Ben’s nine month checkup (which went very well). We ended up throwing a third doctor’s visit into the mix, as Randi the Wonder Kitty was throwing up (more than usual) and suffering from diarrhea (as if cat feces wasn’t unpleasant enough already). Still, she turned out to be doing just fine, and whatever was bothering her seemed to pass pretty quickly. After that, my wife took me out to finally see Spider-Man 3 (which I’ll agree with most critics that it wasn’t as good as the previous two) and have a nice dinner by ourselves. I received some nice gifts from all my family and nobody made a particularly big fuss about it, which is exactly what I wanted. But I will tell you about the most interesting gift I received, which was “from” Ben. (Yes, I’m realistic know that a nine-month-old baby probably would have had extreme difficulty picking out and purchasing such an item over the Internet by himself, so I know he had help from Mommy.) I have finally plunged off the technological cliff with the rest of the lemmings and am now a proud owner of an iPod. For some reason, I seem to resist some trends, even when they’re obviously techie. It was years after cell phones became hip and commonplace that I finally caved and signed up for one, and even now my current phone (my second) is rather spartan and utilitarian. No music or video, no Web access, not even a camera; it makes phone calls and that’s about it. The most useful secondary features it has are the contacts list (which is a watered down version of what’s in my LifeDrive) and the tip calculator (which is usually handier to get to than the one in the Palm). I had no immediate interest in MP3 players initially, preferring the permanence of CDs. Even once I started using PocketTunes on the LD, I have never purchased music online; I always ripped my existing CDs and encoded them myself. In fact, with the LD’s built-in 4GB drive plus any number of Secure Digital cards, I never felt the need for a dedicated MP3 player. So now I’m the owner of a sleek, black, “fifth generation” 30GB iPod. (I understand the “video” part of the name was dropped at some point.) I’ve got to admit, this thing is pretty slick. There are some very good reasons why these things dominate the portable media market. I had always heard the interface was intuitive, but I didn’t realize it was so ridiculously easy to use. I barely even looked at the instruction card (it’s hard to call it a manual, when there’s only a few fold out pages and very little actual information). I was using it almost right out of the box with no tutorials. It did take a day or two of on-again, off-again syncing to copy all my media onto it, but that was relatively easy to do. It imported my previously ripped CDs without (much of) a hitch and ripped the rest (new CDs I received for my birthday plus a few I never bothered to copy before) very quickly. I re-encoded some of my home videos of Ben into a compatible format and they look awesome on that tiny screen. It took a bit to figure out the podcast subscription setup, but once I got it down I was able to add the few podcasts I listen to with relative ease. The jury is still out on battery life as I haven’t been able to listen to it too extensively yet, but it does seem to be holding up better than the LD for extended listening. The iTunes help file is pretty useless. On the few times I’ve had to look something up, it’s taken forever for find it in the help file or I’ve never found it and had to figure it out myself. Other forms of help are only available online. I understand that iTunes works as a largely online application with the whole integrated store, but what if I’m just charging/syncing without a wireless connection and I run into trouble? How is the Apple website going to help me then? Minor personal irk: iTunes by default organizes files by artist, then album, and there’s no apparent way to change this. Yes, I found out too late that you can organize your files manually yourself, but I only found that setting after iTunes completely reshuffled my files every which way. While I’m sure artist-to-album makes sense for certain setups, it really trashes compilation albums. I ripped one Dr. Demento collection and ended up with dozens of artist folders, some with only a single song file in them. Now without iTunes it’s impossible to find everything associated with that album again, which makes me wonder just how stable iTunes really is. The same thing happened with my Nightmare Before Christmas soundtrack, which put all the instrumental pieces under Danny Elfman but each song under the person singing the solos. LifeDrive: So… you’re the new guy, huh? iPod: Yep! Hi, I’m an iPod! And you are…? LD: A LifeDrive. From Palm. You know, they make PDAs. iP: Oh… one of the “old guard.” Gotcha. LD: “Old guard?” What’s that supposed to mean? LD: So… you play music. What else can you do? iP: Oh, I can do much more than that! I do podcasts as well. That is, after all, where podcasts got their name. LD: Jeff used me to listen to his music and podcasts all the time. iP: I can do video too! LD: Got about a hundred megs of baby videos right here on this SD card. And I saw the files he converted for you. They’re several megs bigger than the files he encoded for me. iP: I can also play games! LD: Been there, done that, bought the leather case with a belt clip. What else you got, kid? LD: Copious amounts of storage space? iP: HA! Got you there, old man! 30GB right here. How much do you have? LD: Er… built-in? Only 4GB. LD: But with SD expansion cards I have virtually limitless capacity! iP: And just how many cards do you have? LD: Well… um… if you add them all up…? LD: Um… there’s the ones here in my case… add in these old ones in the briefcase… maybe count the ones with the old Tungsten C… so… approximately 3.84375 GB? iP: Never mind. I’m sorry I asked. iP: Well… at least you’re not a Windows Mobile device. LD: Of course not. I’m from Palm. Although some might say my OS is becoming outdated, at least it’s not a watered down version of a piece of desktop bloatware. The only reason those guys have so much more memory and processing power is because they need it just to make the darn OS run. And I won’t even associate with those Treo 700w’s and 750’s. Traitors. LD: Why do you say that? You got something against Microsoft? iP: Well, duh. I’m from Apple. LD: OH…. That… that says a lot right there. iP: I think this is the beginning of a beautiful friendship. LD: Just keep your ear buds to yourself, kid, and you’ll get along here fine. Just wait ’til you meet Cell. He’s… special. If his antenna falls off, try not to notice. Last night, I was working on one part of implementing the GPF update changes previously mentioned. Since I’ve been having some trouble getting a response from the Keen Tech Crew (who I assume have been as busy with real life things as I have), I decided to try and implement a backup plan in case they couldn’t get their part done by Monday. It’s all rather technical… but then you guys probably enjoy reading my technical ramblings from time to time. (Either that, or you ignore the Technology category altogether. Take your pick.) Unfortunately, it involves some intimate knowledge of Keenspot’s update mechanism, Autokeen, which most of you probably don’t have. Long story short, Autokeen uses templates that are parsed by a massive Perl script that replaces certain “tags” with actual content. For example, the tag ***todays_comics*** gets replaced with the necessary HTML to display any images or text that have been designated as “comic” files. This obviously includes the images for the dailyweekly strip, but it can also use text and even Flash. The GPF News is treated as a “comic” by Autokeen, even though it’s all text. Unfortunately, while there can be multiple “comics” under one account (for GPF, they include the main comic, the News, the Sketchbook, the High-Def archive, and a few others), the way these templates are used means that each “comic” is pretty much autonomous and self-contained. There are ways to get cross-comic content (like how I get the most recent News date and blurb automatically on the main and High-Def pages), but it’s definitely not trivial and it stretches Autokeen’s capabilities beyond their original intended functions. Autokeen is incredibly flexible, which is a credit to Darren Bleuel’s design, but you can tell when you’ve taken it places it’s never been before. Anyhoo, I was building a Perl script that would be run on a cron to do some of this cross-comic work for me, just in case my original pure-Autokeen design didn’t work as expected. I was connected to the GPF server via SSH, editing the file directly on the server via vi. I tested it pretty thoroughly and was happy with the results. By this point, it was getting late, Ben was already asleep in my wife’s arms, and we were both ready to go to bed. I shut down the laptop, we took Ben back to his crib, and while she brushed her teeth and performed other nighttime preparations, I climbed into bed. It was then that I realized I had a fatal flaw in my code. (Nobody ever said inspiration was either punctual or convenient.) While it would successfully build some symbolic links on Monday, Wednesday, and Friday, I forgot to limit the code that removes the symbolic links on the other days of the week. Thus, every Tuesday, Thursday, and Saturday it would undo all the changes it made the days before. It was getting late and I had to get up early in the morning to head off to work. I didn’t have time to fire up the laptop again and I didn’t want to go into the office to log into one of those machines and leave my sweetie waiting up for me. I grabbed my LifeDrive and fired up its WiFi connection. I have a small SSH client for Palm OS called pssh and used it to log into the GPF server. Now pssh is a wonderful little tool, but anyone who has used a PDA probably knows that entering text into one can sometimes be… challenging. Palm has used Graffiti for years, but it can sometimes be a pain when working with applications that are very sensitive to text input mistakes (such as, say, vi). I elected to use the on-screen keyboard instead, and only switched to Graffiti when I discovered the keyboard didn’t have a pipe symbol (required to do a boolean “or” condition). Switching back and forth between edit and command modes was <sarcasm>fun</sarcasm>, even though pssh includes a nice little “ESC” button on the screen for emulating the Escape key. Old hands at vi will know you can always hit ESC multiple times to ensure you’re no longer in edit mode and that you’re back in command mode, but it seems I left the volume on the Palm up pretty high from listening to MP3s earlier. The default “bell” was embarrassing loud, especially with a sleeping baby lying a few feet away. It took some work, but I finally got the changes incorporated and saved and compiled the script. As soon as I logged off, I realized just out absurdly geeky the entire experience was. I probably could have done things faster if I had just walked into the office across the hall and fired up PuTTY, but instead I decided to do things the hard way: working on a tiny little battery-powered device, connecting wirelessly, and fumbling with awkward text input mechanisms to use what is arguably one of the most complex text editors to make what would have been a ten-second change anywhere else. For some reason I found that obscenely amusing. You could probably care less, I’m sure, but I thought I’d share anyway. Well, my Tungsten C is back to life. Following the events of the March 1st post and the purchase of the subsequent replacement, my wife and I began to discuss what to do with the corpse of the T|C. We considered chucking it or selling it for parts on eBay, but ideally it would make a nice hand-me-down replacement for the IIIc she inherited from me when we bought this one… assuming we could get it repaired, of course. Sadly, this thing has been out of warranty for a couple years, and at this point Palm asks for $169 up front just to look at it (not counting any parts, labor, or shipping thereafter). Sadly, electronics don’t last forever, and handhelds live far more hazardous lives than, say, your stereo does. So there you are, living your worst case scenario. You’ve dropped your Clie and broken the screen. What do you do? Simple. You call Chris Short. Thanks to a recent article in The Inquirer, he’s quickly become the most famous repairer of broken older handhelds. I checked out the Inquirer article in question. I followed the links there to Mr. Short’s eBay sales listings and checked out his impressive 100% 2000+ feedback history. Intrigued, I went ahead and bid on one of his Broken Palm Evaluation and Repair Service auctions and subsequently won. I shipped off the T|C with a nice little check for around $100 (for parts, labor, and return shipping) and waited to see what happened. Sure enough, the T|C returned to us yesterday, good as new. He even took the old screen protector off the broken LCD and either transferred it to or replaced it on the new screen. And it may be my imagination, but he either cleaned the keyboard I spilled orange soda pop on years ago, or the simple act of opening the case must have helped, as several keys on the keyboard that were sticking painfully are now operating as if it were straight out of the box. My wife has already worn the battery down completely playing Sudoku and Bejeweled. So kudos go out to Mr. Short and his little eBay business. His service comes highly recommended from this handheld geek. Well, here it is. Following the events of the previous post, we drove down that night to High Point to pick up the new LifeDrive I ordered via the Web. (The Circuit City in Greensboro didn’t have any in stock, and I wanted to get a replacement ASAP before a business trip to Orlando (which is also why I haven’t posted about this until now.)) I’m not a big Circuit City fan; I’m not sure what it is, but the few times I’ve ventured into one, the sales staff have either been unfriendly, unhelpful, or just plain unavailable. I haven’t had nearly that bad of an experience at a Best Buy, and I’ve gone into one of those ticked off and demanding a refund. I have a completely unscientific theory about a war of primary colors, i.e. Circuit City’s “hot” and “angry” red vs. Best Buy’s soothing and friendly blue, but it’s probably just a cartoonist’s imagination. Anyway, the LifeDrive. I’ve got to admit, I’m impressed. I’ve heard a few negative comments about it, and there’s some truth behind them. However, this baby has a good bit of power behind it. What boggles the mind to begin with is the whopping 4GB hard drive built into the thing. Palms are markedly different from Windows Mobile devices (aka PocketPC and all those other previous incarnations) in that they typically have much smaller memory requirements, a fact I blame entirely on Microsoft’s ever wasteful memory handling from the desktop down. My old Palm IIIc only had 8MB of RAM and functioned perfectly well on that. However, we’re always looking to cram more and more stuff into our pockets, and I’ll admit there were a few times I had to delete a few things from my Tungsten C’s 64MB to free up space. The LifeDrive also comes with 64MB of RAM, as well as the prerequisite SD slot that can provide you as much hot-swappable extra storage as your wallet can provide. But it’s that 4GB drive that really opens things up. It’s hard to think of anything really worth filling up 4GB of portable space… until you start thinking about multimedia. But I’ll get to that in a bit. Coming from the Tungsten C, I’ve got to admit that the most annoying thing about the LifeDrive is that long pause when opening new apps. The T|C was such a quantum leap in speed from my IIIc, I got use to that virtually instant tap-and-it’s-open response time. The LifeDrive seems to access the hard drive even when opening applications that are supposed to be stored entirely in RAM, which adds a noticeable lag that almost feels like I’ve downgraded back to the IIIc. I had always heard the T|C was the fastest of all the Palm devices, even over later offerings. Of course, after using the LD for about a week, it just proves you can get used to almost anything. I’ve learned to adapt my usage patterns to compensate for the lag and while it’s still noticeable it isn’t quite as annoying. The only app that really hurts from the lag is Laridian’s MyBible; even with the large Bible data files completely in RAM it seems to take a full ten to fifteen seconds to open, versus about two seconds on the T|C. Don’t ask how long it takes when stored on the HD. That said, everything else about the LD is pretty spiffy. I like the large screen, and Graffiti 2 (which I avoided learning with the T|C’s built-in keyboard) is actually more intuitive than the original Graffiti was. The lock switch is a smart idea, letting you physically disable the buttons and digitizer to keep the device from turning itself on or off accidentally. “Drive mode” lets you turn the LD into a USB external hard drive (both the internal HD and any SD card currently in the slot) even on computers where HotSync isn’t installed. And the WiFi system seems to be better designed than on the T|C (at least it seems to behave better than the T|C did). As I have no Bluetooth devices to connect with, I guess I can’t really comment on that functionality. However, with that big ol’ drive, you can probably guess that this thing is ideal for portable media. It’s not going to replace any loyal iPod fan’s favorite device, but combined with the pre-installed Pocket Tunes it can become a very capable MP3, Ogg Vorbis, and WMA player. (Hey, that already meets or beats the iPod shuffle and nano.) It also supports some types of video media out of the box, although installing TCPMP lets you run XviD and similarly encoded video. 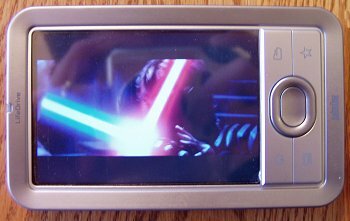 In the picture above, you can see a not-so-great screenshot of Star Wars: Episode III; the poor quality of the photo comes from not using a flash (to prevent glare) and not from the encoded video, which is actually really great. I took the entire Star Wars saga with me to Orlando: all six movies plus the two Clone Wars specials. That made waiting for a greatly delayed return flight a bit more bearable. Anyhoo, that’s about all I have to say about the LD at the moment. I’m still trying to decide what to do with the T|C. Having it fixed by Palm is going to be expensive ($169 just to open a ticket, before any parts, labor, or shipping), but I’ve found a few places where I can buy the parts I need and have it fixed for under $100. If I can fix it, I’ll probably let my wife have it, as the hand-me-down IIIc’s battery is finally failing. Otherwise, we’ll probably need to buy her another new one for her own use and then sell or give away the T|C. I’ll post some more interesting LD stories if any present themselves. No, that’s not some sort of funky new graphics program you’re seeing on my Palm. My Tungsten C gave up the ghost last night. It appears to be functioning properly… with the exception of that sickening blob of blackness on the right side of the screen rendering the rest of it unreadable. As far as I can tell, it looks like the LCD was somehow crushed, totally ruining the screen. I’m not entirely sure when it happened. I know I got to church last night a little before 7PM, and everything was just fine. I was showing off the baby’s heartbeat sound clip I recorded earlier to whoever would listen. We then went out on our visitation assignments (Tuesday is when we perform our FAITH Sunday School visitations). Once we got back, I pulled out the Palm to let the pastor listen to the sound clip, and that’s when I found the crushed screen. I honestly can’t think of anything I could have done in the course of that hour or so that could have possibly damaged it that severely. Trust me, I’ve done far worse to this thing over the years, and it’s bounced back with hardly a twitch. Fortunately, I synced the Palm earlier in the day to get the baby’s sound clip off, so all my data should be backed up. Hot on the heels of the previous month’s hard drive crash, I’m almost getting technologically paranoid. I have this sudden urge to backup every byte of data from every hard disk, floppy, CD, and DVD onto hardcopies–hardcopies–and bury it in the back yard. I’m just not sure where I’ll get the “rapid” wombats. I’ve purchased a new Life Drive as a replacement through Circuit City (their prices were actually better than direct from Palm or from my beloved Best Buy). To be honest, I don’t know if this was the best choice or not. I wavered between the Life Drive, the TX, and the Treo 650. 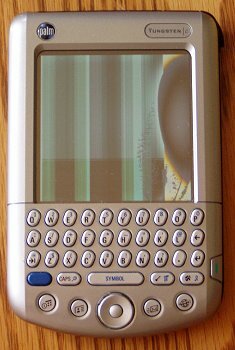 Actually, while the Treo was an early favorite, I couldn’t bring myself to purchase a new cell phone while my current el cheapo one is perfectly fine. The Life Drive just had more bells and whistles. We’re picking up the new device tonight and I’ll probably end up posting about it soon enough.